Citation Information: J Clin Invest. 2017;127(12):4415-4420. https://doi.org/10.1172/JCI93486. Primary immunodeficiencies are often monogenic disorders characterized by vulnerability to specific infectious pathogens. Here, we performed whole-exome sequencing of a patient with disseminated Mycobacterium abscessus, Streptococcus viridians bacteremia, and cytomegalovirus (CMV) viremia and identified mutations in 2 genes that regulate distinct IFN pathways. 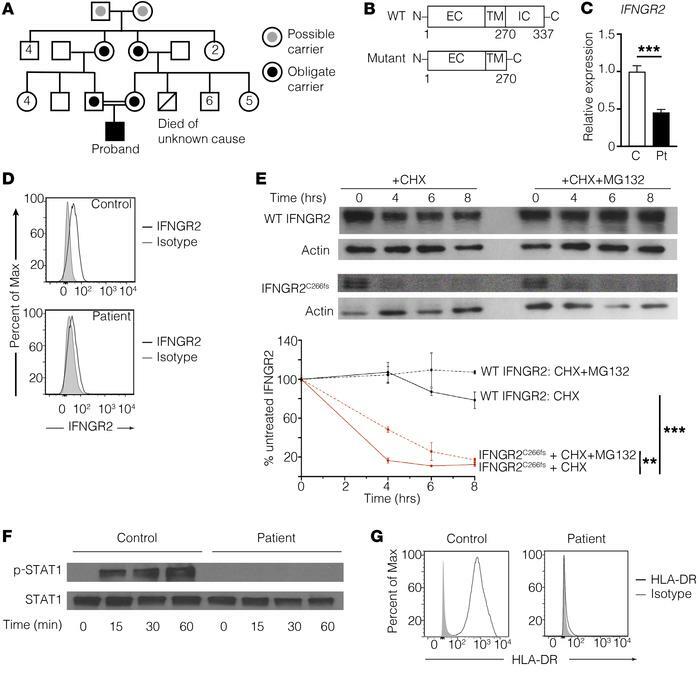 The patient had a homozygous frameshift deletion in IFNGR2, which encodes the signal transducing chain of the IFN-γ receptor, that resulted in minimal protein expression and abolished downstream signaling. The patient also harbored a homozygous deletion in IFNAR1 (IFNAR1*557Gluext*46), which encodes the IFN-α receptor signaling subunit. The IFNAR1*557Gluext*46 resulted in replacement of the stop codon with 46 additional codons at the C-terminus. The level of IFNAR1*557Gluext*46 mutant protein expressed in patient fibroblasts was comparable to levels of WT IFNAR1 in control fibroblasts. IFN-α–induced signaling was impaired in the patient fibroblasts, as evidenced by decreased STAT1/STAT2 phosphorylation, nuclear translocation of STAT1, and expression of IFN-α–stimulated genes critical for CMV immunity. Pretreatment with IFN-α failed to suppress CMV protein expression in patient fibroblasts, whereas expression of WT IFNAR1 restored IFN-α–mediated suppression of CMV. This study identifies a human IFNAR1 mutation and describes a digenic immunodeficiency specific to type I and type II IFNs. IFNGR2C266fs has minimal protein expression and abrogates downstream signaling. (A) Pedigree of the proband’s family. No one in the extended family has recurrent infections. (B) Schematic of wild-type (WT) and the mutant (IFNGR2C266fs) IFNGR2. EC, extracellular domain; TM, transmembrane domain; IC, intracellular domain. (C) Quantitative PCR of IFNGR2 mRNA from control and proband (Pt) fibroblasts, normalized to GAPDH as a housekeeping gene and expressed relative to the control. (D) Flow cytometric analysis of the wild-type (WT IFNGR2) and mutant (IFNGR2C266fs) protein expression on CD14+ cells from a control and the proband, respectively. (E) Decay curves of WT and mutant IFNGR2 transfected into 293T cells, treated with the protein inhibitor cycloheximide (CHX) with or without the proteasome inhibitor MG132. **P < 0.01, ***P < 0.001, 2-way ANOVA. Results are pooled from 3 experiments. (F) Immunoblot of STAT1 phosphorylation after IFN-γ stimulation of fibroblasts from the proband and a control. (G) Flow cytometric analysis of HLA-DR expression on patient or control fibroblasts stimulated with IFN-γ. All data are representative of 3 independent experiments using 2 controls.